Malaca Instituto is an awarded winning Spanish language school in Malaga with more than 40 years of experience teaching Spanish. The school is renowned for its teaching philosophy that combines communicative approaches with grammatical teaching. Malaca Instituto has an outstanding campus with everything you could need on-site, including an incredible School Residence! With an average of 60 staff members, students receive a high level of attention and are surrounded by a friendly and safe atmosphere. It is also ideal for social and professional networking. The perfect place to learn Spanish in Malaga. Medium-high intensity means Malaca Instituto is above average and requires a bit more work in order to keep up with the pace of the course. On the upside, you’ll also be learning and mastering the Spanish language at a faster rate. Extraordinary facilities all onsite: 25 classrooms, 96 bedrooms, 3 terraces, a study center, bar, restaurant, student lounge, swimming pool, dance studio, gym, etc. The reception desk is available 24-hours a day, it's the perfect place to take Spanish courses in Malaga! 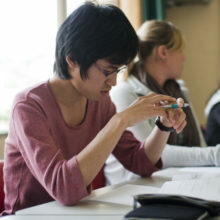 EAQUALS (Evaluation & Accreditation of Quality in Language Services) is an elite academic accreditation in association with cultural institutions such as the British Council, the Goethe Institut and Oxford University Press aimed at providing exceptional language education to individuals worldwide. Malaca Instituto is the only Spanish school to have been awarded with the Super Star for winning 5 Star Awards by the Study Travel Magazine for Spanish Language Schools. Málaga is the capital of the Costa del Sol region in the south of Spain and stretches over kilometers of beautiful beaches due to the city's increasing expansions along the coastline of the Mediterranean sea. Founded by the Phoenicians as Malaka in 770 BC, Málaga is considered as one of the oldest cities in the world as well as one of Spain's economically and cultural emerging cities. Native to the famous painter Pablo Picasso, the city offers 28 museums, two of which, the Museo Picasso Málaga and Picasso Birthplace Museum, reveal the life of Picasso. There are also three major events in Spain that are held here: the Málaga Fair (Feria de Málaga), the Holy Week and the Málaga Film Festival. The Mediterranean climate provides a perfect environment to enjoy the city with an average of 300 days of sunshine, beautiful beaches and friendly locals to meet walking down the streets. This Spanish language school in Malaga is located in a peaceful residential area, just 15 minutes by bus from the city center and a 10 minute walk to the beaches. The Intensive 20 course includes 50 minutes with 20 lessons per week. The maximum number of students per class is 10 people. The content of the lessons cover all aspects of the Spanish language, at each level. Malaca Instituto produces most of their own textbooks and supplementary materials. The involvement of senior teachers in developing the teaching materials and new programs creates a stimulating academic environment and is crucial for the provision of high-quality teaching. This evolving philosophy guides the content and form of the school books. During this course the school prepares students in Spanish language to enter universities, including Spanish for Academic purposes. It also provides advice and guidance for university paperwork, both for undergraduate and masters degrees. An Intensive Course of general Spanish combined with serious cooking lessons and activities related to gastronomy. The General Spanish Course includes 5 cultural activities per week: 2 flamenco dance classes, 1 salsa class, 1 presentation of a film and 1 cultural talk. 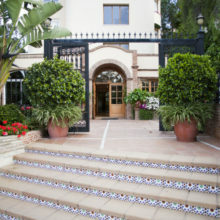 Note: The total costs above refer to Intensive 20 course and include class, Malaca Instituto course books, welcome aperitif, cultural activities, free tour of Málaga, use of swimming pool, use of multi-media centre, aerobic-type activity twice a week, party with live music (on ave. every 3 weeks), staff support and certificate of attendance.